Free WiFi, free breaky and free bikes! Did I mention town center? Perfect place for budget travellers. Awesome location, Great value. Girls dorms available. Huge saltwater swimming pool, big roomy dorms, free internet and WiFi for all guests and a cheap and friendly bar and bistro for cheap food and drink - perfect place for budget travellers. 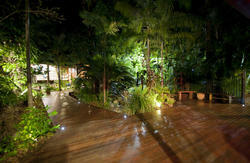 Parrotfish is centrally located in the popular North Queensland town of Port Douglas. Close to Cairns (and the international airport) the town is very easily reached along one of the most spectacular and beautiful coastal roads to be found anywhere. To make life even easier, Parrotfish can arrange your transfer from Cairns city or airport. See www.parrotfishlodge.com. The pickup service is FREE when booking 7 nights or more. Please see our website and follow the 'cairns pickup' link to arrange your bus at least 24hours before your arrival.